Week three of the new Top Gear has come and gone. If you didn’t tune in, you’re part of an unprecedented exodus from the formerly-popular British motoring show that seems to be growing with each additional episode. The question on everyone’s lips, but especially on Twitter’s keyboards, is what exactly this means for the future of the show and its main host, Chris Evans (not that one). This week’s drop was not as dramatic as last week’s loss of a third of the live broadcast audience from the first episode, but it still shows a trend of dropping ratings that might be hard to recover from. Overnight ratings stand now stand at 2.371 million, down from 2.8 million for the second episode. You might be asking why the ratings numbers this week have been taken out so many decimal places. That would be because the lowest ratings ever received by Top Gear under the leadership of Jeremy Clarkson’s team was reached in June of 2003, when episode six of Clarkson’s second series reached 2.362 million people overnight. The means that only nine thousand people stand between this new season of Top Gear and the franchise’s lowest point. To be fair, the Guardian reports that the third episode of the show has been the most well received by the critics. It finally showed footage from Chris Evans’ highly-publicized bout of car sickness while in the car with co-host Sabine Schmitz. Matt LeBlanc’s tour of London finally aired, sans the controversial Cenotaph war memorial stunt that set off a scandal in the UK. Many supporters of the new show are also quick to point out that the show was running against a special episode of Coronation Street and Germany’s match against the Ukraine at Euro 2016. 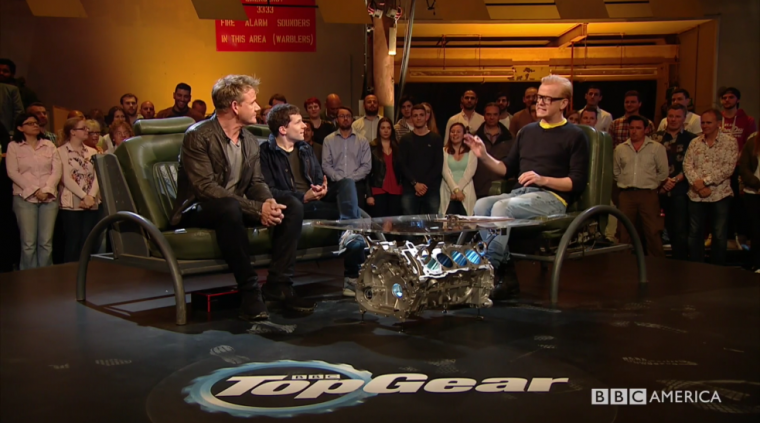 One of Top Gear‘s loudest voices, host Chris Evans, has been uncharacteristically quiet. This might because it has been recently been revealed that the consolidated ratings for the series’ second episode slid just as much as its overnight ratings did, from 6.4 million to 4.1 million people. Previously, Evans had a rant on Twitter that the consolidated ratings, which include people who record and watch the show later on their DVR devices, would look much better (and be more relevant) than the huge overnight ratings loss of 1.5 million viewers. While none of these ratings figures show how many people watched the show via BBC’s iPlayer, it is still troubling for show leaders and BBC advertisers.